Welcome, and thanks for your interest! If you're looking for a Tarot Reading, Biofield Restoration, or Spiritual Consultation please click on the Metaphysician link. You'll also find song-poems for each of the major Tarot cards and a Tarot tutorial. 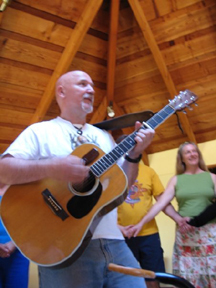 The Musician page has information about the house concerts I offer, freelance CD production (including music editing, mastering and graphic design) and my CDs for sale. I also provide various groups, meetings, seminars and retreats with the uplifting bonding experience of the Dances Of Universal Peace. Learn more by clicking on the Dance Leader page. I was born in Rochester, New York. At age five my family moved to a rural area outside of town, where I attended a two-room Catholic school next to a bull pasture. We moved to Orange County, California when I was twelve. I attended California State University, Fullerton, and earned two degrees: Philosophy and Music Composition. I did graduate work at UC Santa Barbara, then a few years of independent study. At age 30, I gave away everything I owned and set off walking, trusting in my spiritual guidance, for the next ten years. During this time I received many initiations, worked with elders and teachers of various traditions, learned astrology and numerology - and mastered the secrets of Tarot.